The Readius e-book's display can be rolled up into its case. That electronic-paper vision of the future we've been gazing after for so long may finally be upon us if the new flexible e-book from Polymer Vision lives up to expectations. Although an on-sale date (sometime this year) and pricing have yet to be announced, we're already impressed. The Readius e-book, which will initially be marketed only in Italy by Telecom Italia, is compelling on many fronts. 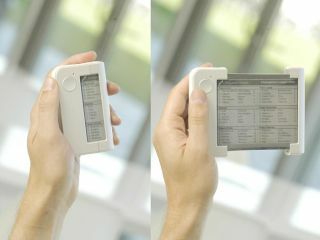 Foremost is the 5-inch greyscale e-paper screen that is sufficiently flexible to be rolled up into the device's housing. The folded book looks to be around the size of a small phone. As the name of the manufacturer suggests, the Readius screen is polymer based. Then there's the fact that the device uses a regular mobile phone SIM card to maintain an EDGE/UMTS connection to the Telecom Italia network that will deliver newspapers, books, email, local maps and more. Downloaded data - or, indeed, anything introduced via the USB port - can be stored in an impressive 4GB of internal memory. The rechargeable battery inside the Readius is expected to last ten days between charges. Support for mobile TV broadcasts that can also deliver data to the Readius, a touch-sensitive screen, upgrades to include video support, and audio playback complete a package that is surely but a taste of things to come.